VANCOUVER – Furniture and decorative accessory specialist Urban Barn, whose marketing position is to help Canadians feel ‘right at home’ is encouraging its customers to help animal in need feel the love with its latest Blanket the Country campaign. 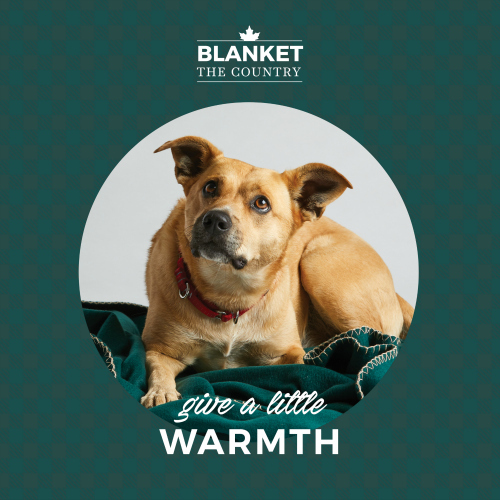 Beginning on 05 October, an in-store or online donation of $5 will ensure a brand-new fleece blanket goes to an animal in an SPCA or affiliate shelter. The company helps to donate some 10,000 blankets to shelters across the country over the next month. Donations will be accepted at any of Urban Barn’s retail locations across the country and on its web site at www.urbanbarn.com. The Blanket the Country campaign will run nationally through 04 November 2018. Canada is a country of animal-lovers, she noted, adding, with almost two in three Canadians owning a pet. Despite the high rate of pet ownership in Canada over 150,000 cats and dogs are received by shelters across the country each year. This places a significant resource burden on these shelters, which Urban Barn hopes to help alleviate with the campaign. To further support SPCA shelters, Urban Barn will feature adoptable animals from the BC SPCA in its upcoming Holiday Lookbook. The company has held similar campaigns in 2017 and 2016 with the proceeds donated to women’s shelters across the country. Founded in 1990 and owned by Stern Partners, a private equity group based here, Urban Barn currently operates 55 stores from British Columbia to Quebec.